1. Heat a large skillet over moderate heat. 2. Add oil, butter, garlic and shallots. 3. Gently sauté shallots for 3 to 5 minutes to develop their sweetness. 4. Add vodka to the pan (3 turns around the pan in a steady stream will equal about 1 cup). 5. Reduce vodka by half, this will take 2 or 3 minutes. 6. Add vegetable stock, tomatoes. 7. Bring sauce to a bubble and reduce heat to simmer. 9. While sauce simmers, cook pasta in salted boiling water until cooked to al dente (with a bite to it). 10. While pasta cooks, prepare your salad or other side dishes. 11. Stir cream into sauce. 12. When sauce returns to a bubble, remove it from heat. 13. Drain pasta. 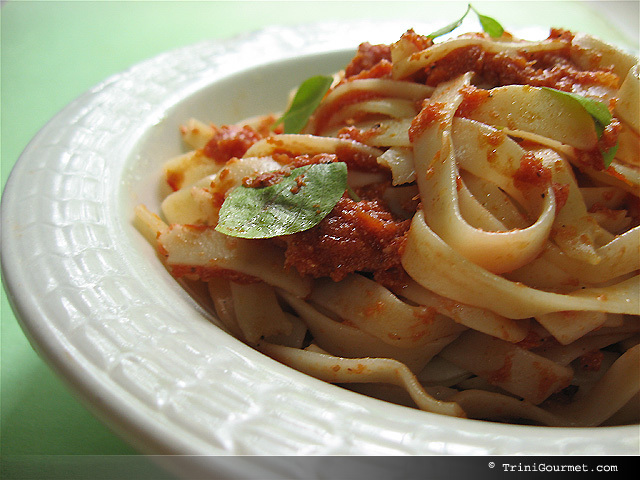 Toss hot pasta with sauce and basil leaves. 24. Pass pasta with crusty bread.